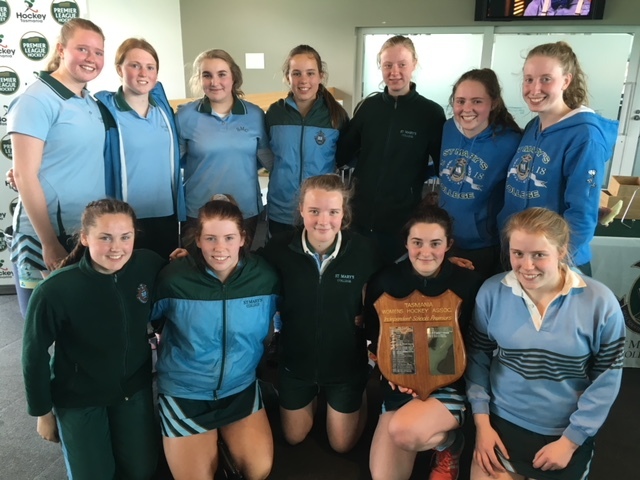 In the 2018 SATIS Girls Hockey Final, Southern finalists, St Mary’s College took on Northern winners, Marist Regional College for the second year in a row. Both teams had a number of experienced club players and it was evident from the start that it was going to be a good game of skill, speed and tactics. St Mary’s got on the scoreboard first with Olivia Eade scoring off a rebound from a penalty corner shot with Marist College quickly equalizing a couple of minutes later. Right before half time, St Mary’s capitalized on another penalty corner with playing coach, Livinia Sproule, trapping and hitting the goal from top of the circle to make the score 2-1 going into the break. The second half belonged to St Mary’s who secured their 3rd SATIS title after scoring two more goals from Chloe Cooper and Livinia Sproule finishing very strong on 4-1. Marist Regional College played hard until the end and made a number of attacking runs into the St Mary’s circle, falling just short in putting the ball away. Well done to both teams on a great season and thank you once again to Hockey Tasmania for their assistance and support.